As you know I was on hiatus this past week (I’m sure you were all crying into your compacts)… That’s because I was on my Babymoon (and no I didn’t just make up that word to trick my husband into taking me to Hawaii) for our last romantic trip before the bambino arrives. Now, you know how I feel about sunscreen so you better believe I went to paradise armed with an arsenal of SPF powerhouses and wide brimmed hats. Since I had just written the “Screening Sunscreens” piece for the San Francisco Chronicle a few weeks back, my beauty cabinet was stocked with a bevy of sunscreens per my choosing. 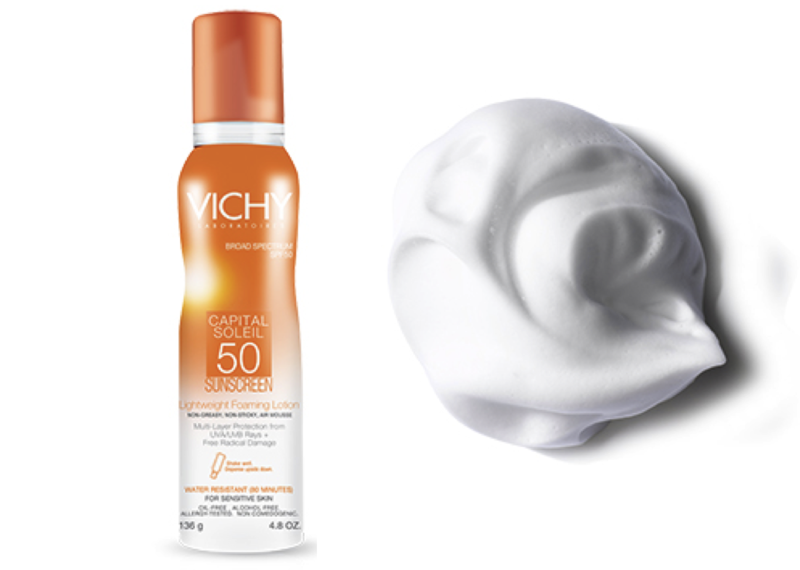 Even though I brought four different body sunscreens with me on the trip, only Vichy Capital Soleil SPF 50 Lightweight Foaming Lotion made it out of the suitcase. It was love at first foam. There is something so divine about spreading a fluffy non-sticky air mousse on your body instead of a greasy oil or liquidy lotion. First of all, it is so much easier to keep track of where you’ve applied. Second of all, it just feels amazing. But, what’s most compelling to me about this sunscreen is that not only does it have broad spectrum “multi-layer protection from UVA/UVB rays and free radical damage,” it’s packed with a potent dose of White Grape Polyphenols and Vitamin E for antioxidant protection. Dermatologists have been quoted EVERYWHERE saying that by combining antioxidants with sunscreen you further protect your skin from sunburn-causing rays and dangerous free radicals. I’m telling you this foam is the wave of the sunscreen future. The FDA is already scrutinizing sunscreen sprays and threatening to take them off the market because they’re worried about the sprays’ efficacy in properly protecting the body. You don’t have that issue with this fluffy foam. The Capital Soleil is also water-resistant for up to 80 minutes and it’s appropriate for sensitive skin so I slathered it on my face too. That’s right — my bitchy drama queen skin didn’t have a damn thing to say about the foam. I didn’t get even a spot of redness and the sunscreen protected my skin through hours of swimming and floating.